Review written by and copyright: Rick Curzon (22nd August 2018). In the creepy compendium style of CREEPSHOW (1982) comes DEADTIME STORIES (1985) a collection of stories with teeth and torment that are sure to send chills down the spines of viewers even today! A sleazy and shocking pack of splatter fairy tales - this contemporary spin on the likes of "Little Red Riding Hood" has gore aplenty, a sick sense of humour and enough splattered limbs to make for essential late night viewing. Directed by genre veteran Jeffrey Delman and packed full of plastic fantastic charms, 88 Films is enthusiastic about keeping you up at night with this perfectly restored version of a VHS cult classic! Truly, truly terrible 3-part horror portmanteau with a terrible script, terrible performances, terrible direction. It tries to be funny and tongue in cheek but falls flat on it’s face at every step with each story being worse than the last. Action scenes are very clunky. On the positive side the cinematography and SPFX aren’t bad. But you can’t polish a turd. Amateurish in the extreme despite the moderately slick look. This is a pretty standard looking low budget ‘80s film with that pastel, hazy look we’ve all come to know well when reviewing these discs. Colours are rich and full bodies and this reflects the cinematography which is probably the strongest feature of this film. In the red riding hood sequence (story two) the leads red jogging outfit looks particular good, and in closeups there’s plenty of detail in skin and fabrics despite the filtered look. Black levels are mostly very satisfying with inly the occasional moments of crush in some darker scenes but again, this is down to the nature of the original production. Contrast is gentle and allows plenty of detail and textures in brighter, well lit surfaces to come through; no blowouts or whiteouts in evidence. There’s no print damage and no evidence of digital tinkering. 88 Film’s encode is very good with a pleasing grain field throughout and a decent film-like appearance. This essentially replicates the the US region ‘A’ locked Shout! Factory special edition recently although I suspect the 88 Film’s encode will be an improvement. However, I don’t have that disc to do a comparison and this I could be wrong in that score but Shout! track record for encodes is uneven. All in all this is a great presentation of the film and fans should be pleased. The soundtrack is a pretty standard mono track from the ‘80s; it has good fidelity and the base is also robust. The fine score never interferes with dialogue and has a couple of catchy, funny tunes. It a decent 2.0 mono track that gets the job done and serves the film well. Subtitles are welcome. Straightforward commentary track covers all the bases; acknowledges borrowings from other things and influences. Most of the same material pops up from the interview but we get more significant expansions and elaborations. The soundtrack ks discussed at points throughout and apparently there’s a soundtrack album on the cards. Genial conversation in which Delman talks about his film, how it got it going, the fact it was shot over several years (1982-85), the cast with special comment on Melissa Leo and her involvement. The score is discussed along with practically any other topic to do with the production of this low budget feature; it’s quite thorough. Delman’s subsequent career in writing sings and jungles for .disney is also touched upon. Delman appears in a :28 introduction talking about the first cut of The Black Forest story. This is an expanded version of the opening tale in standard definition and therefore doesn’t look as good as the version in the feature. For some strange reason this has been encoded so that you can’t jump to the end or fas forward through it. A short selection of material removed from the final edit and with good reason. Standard theatrical trailers with ominous voiceovers. Decent little still gallery with a nice assortment of pictures from the production. Features the new artwork and the original theatrical key art. Good shirt essay from the reliable Waddell who must be able to write these kinds of essays in his sleep. Excellent! Thick, clear, Blu-ray, keepcase with a card slipcase. I really didn’t get to grips with the film itself, but the disc from 88 Films is a classy affair with fine presentation of this ultra low budget film with very good picture and sound quality. 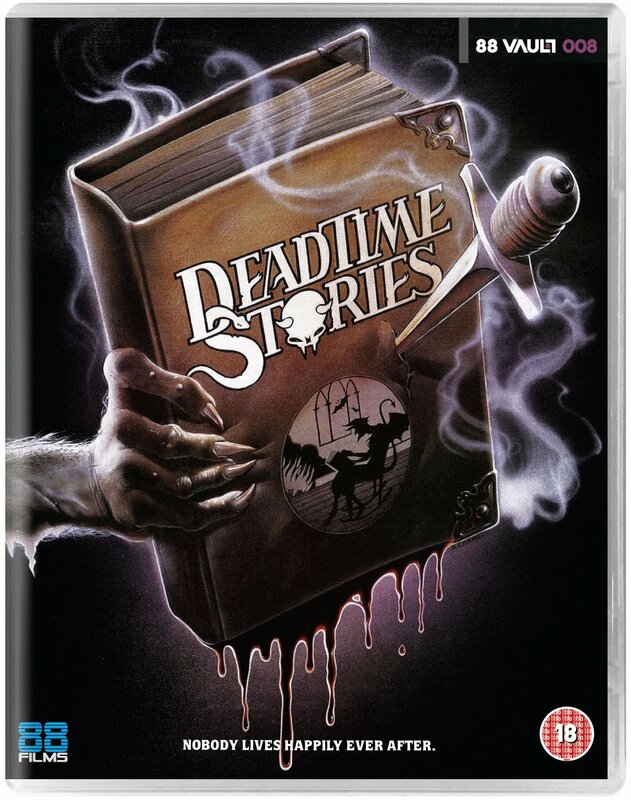 Extras are also very good and mostly ported over from the US disc with the exception of "A Band of Gypsies: The Making of Deadtime Stories" featurette (15:35), which bizarrely has been left off. Fans ought to be please with what they do get however and it’s a reasonably priced entry in 88 Film’s Vault Series.